I came up with the idea for this contest the moment Opie popped his fugly wings on panel. A few months ago, when it looked like Ichigo and Ishida were about to come face to face in this arc once again, nehalenia told me that it looked like Ishida's Vollstandig would be revealed soon enough and we wouldn't be having our contest after all---but naaaah, in true Bleach fashion, that encounter was just a prelude, a foreshadowing of angst and glory. I'm sure Kubo will hold off Uryuu's final form for the final chapters. In the meantime, YOU CAN JUST IMAGINE IT. I threw together a little graphic last week while I was busy and meant to post it, but today's chapter got me all excited again about the inevitability of an IchiIshi showdown--with Orihime watching--and yes, ISHIDA'S VOLLSTANDIG. WHAT WILL IT LOOK LIKE? That's the theme of this year's birthday contest! Yeah!! Let's do this, la_kalaka!!! I'd really like to see people's ideas! 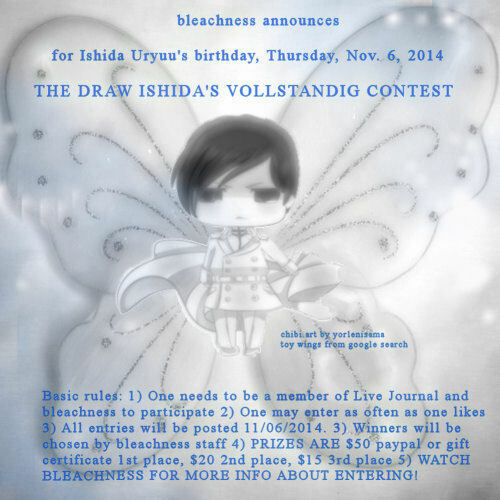 :] I'll draw a little something just for the fun of it instead of a contest entry.